As a digital and technology fast streamer, I’ve just finished a 6 month stint as a business analyst in the DH digital team. My previous posting was at Navy HQ on Whale Island in Portsmouth, working on cyber security and data science projects. Casting my mind all the way back, I really remember noting the distinct differences of environment and culture between my MoD posting and DH. From going from an island to a department on Whitehall was a notable change of scenery. No longer would I see those in uniform stride by, orders being given and ships coming and going. Instead I heard Big Ben’s chimes and saw MPs scamper back and forth from Parliament. I was also walking into a team that operated entirely different to my previous post. As a team we fully embrace agile ways of working . This new (to me) working culture meant getting reacquainted with post-it notes and sharing updates at our daily stand-up meetings. 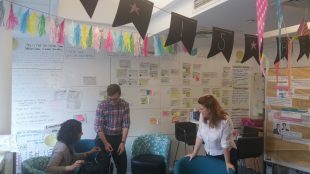 Like many digital teams, we also had a love of bunting so our teamwork skills were significantly tested as we tried to brighten up our workspace. Our wall also was an ever-evolving focal point for triaging our workload and something I’ll look to introduce in my new team at the Department for Work and Pensions. Our agile ways of working helped us adapt when we had some team changes. Some of us were assigned to the NHS.UK project and with a couple of departures, there was a short time when it was just me and 2 others. I’m proud of how we shared the workload, prioritised and made sure we were doing the most important things first. We all supported each other and widened our remit beyond our immediate roles. One of the benefits of being in a small team was the range of work I got involved with and the level of responsibility I was trusted to take on. Along with another colleague, I oversaw much of the digital assurance for DH - my role being to apply the Cabinet Office Digital Spend Controls. Projects ranging from £5,000 to £1 million would land in our shared inbox, all needing timely bespoke advice. This gave me amazing exposure to the governance of delivering digital services and meeting digital standards. In order to assure, I needed to understand and articulate the ways of working described in the Service Standard,such as the benefits of service design, user research and agile methodologies. No matter the value of the spend, it was always a pleasure to try and contribute to building better public services. I also had the opportunity to get more deeply involved with projects - helping to define bespoke discovery phases and working with DH policy colleagues. It was exciting and inspiring to help teams beginning their journey delivering digital services for the first time. After explaining the purpose of a discovery, many were genuinely enthused and reinvigorated to find evidence to better inform their service. I also had the opportunity to work in the Permanent Secretary's office the week that Theresa May became Prime Minister. It was hectic but absolutely fascinating watching the mechanisms of the department respond as a whirlwind of change swept across Westminster. I’d encourage anyone within the department to volunteer for these type of opportunities as they really help in understanding the bigger picture of the department and its work. Overall, the post has been a delight - a great team full of extremely talented individuals, excellent exposure and plenty of juicy challenges to sink my teeth into. I’ll miss DH and all the fantastic work that’s coming up. I leave knowing that all the work left to do is in very capable hands.